With artisan coffee capsules, coffee machines and even freshly-roasted and ground coffee powder, Fresh Brew Co is the perfect answer for all your caffeine needs. For those of you who cannot do without a cup of strong coffee to start your morning, Fresh Brew Co might just make your day. After all, what could be better than a cuppa with freshly roasted and ground coffee, straight from some of the best estates in the country (including Coorg and Chikmagalur)? Oh yes, that’s exactly what the Delhi-based brand’s artisan coffee capsules will give you. Apart from the Nespresso-compatible pods, they also have coffee machines and powder for you to stock up on. Coffee break just got more exciting, we think! Packing in all the goodness of fresh coffee, their capsules come in five versions. While the signature collection includes Certified Organic Karm and Certified Organic Veda (both from 100 per cent Arabica and obtained from Chikmagalur but with variations in flavour), espresso lovers can opt for Dasha(a French roast). Javas, an Italian roast with its berry fruitiness and Dhara’s nutty chocolate finish are bound to have quite a few fans, too. Don’t want to run out of your coffee stock? Sign up for their monthly subscriptions (available for the capsules). If you’re looking for coffee powder, go ahead and pick from their three variants – Suvaas, Mradaa and Prithvi – and specify the grind you’d like (their options include everything from whole beans to Turkish). Available in 250gms packs, the beans are roasted and ground shortly before shipping, so you can be assured of its freshness. While you’re at it, why not get yourself one of their compact and lightweight Nespresso coffee machines, too? And there, you’ve got all your coffee requirements sorted out! 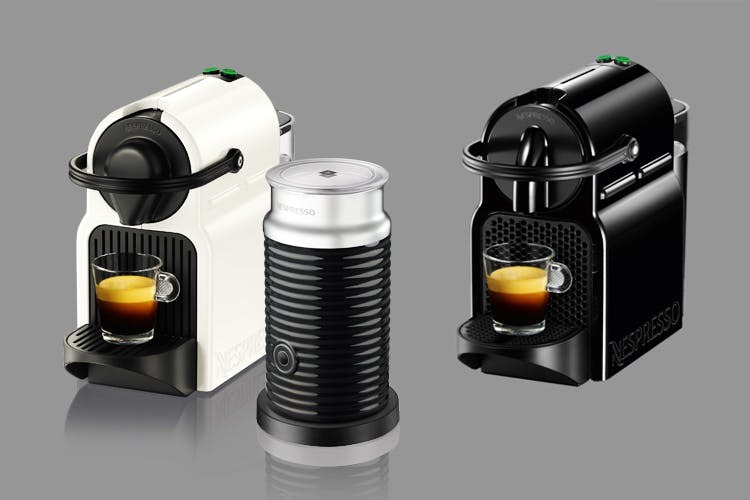 Fresh Brew Co’s Nespresso machines are currently on sale! So, we suggest you get one before it’s late.